Jennie Jones was born in Denver, Colorado. She attended the Layton School of Art in Milwaukee, Wisconsin, the Colorado Springs Fine Art Center and graduated from Northwestern University with a BA in Art History. She joined the education staff of the Milwaukee Art Center where she remained for eleven years. She continued her commitment to the visual arts, both as a volunteer and professional during several moves including Chicago, Boston and Detroit. She moved to Cleveland in 1978. After years of using her photography for educational purposes she established her own studio in 1983, specializing in architectural and urban photography. Her commercial work has included most of the major building projects in Cleveland from 1980 to 2000 including TRW, Inc. Tower City Center, the Old Post Office, the Engineer’s Building, Society Center, Gateway, the Stokes Wing of the Cleveland Public Library and the Tiedman Road facility of the Cleveland Plain Dealer. Her images were the feature of the 1988 International Printing Corporation Calendar. In 2002 and 2004, she photographed the Thoracic and Cardiovascular Surgery at the Cleveland Clinic for their annual international calendars. In 2005, she photographed the twelve United States hospital facilities for the Cleveland Clinic’s corporate calendar, “In Excellent Hands”. During 2002 and 2003 Jennie Jones photographed the construction of the Madagascar and Costa Rica Biomes for the Cleveland Botanical Gardens. She has had extensive one woman exhibitions including the Thomas F. Campbell, PhD Exhibition Gallery at Cleveland State University in 2008, the Humphrey Atrium Gallery, the Mandel Jewish Community Center, the Cleveland Playhouse Gallery, Cleveland State University and the atrium at BP America. Her work was juried into the 1993 May Show at the Cleveland Museum of Art and the exhibition “Photo Opportunities at the Museum of Contemporary Art. Group shows include the Great Northern Corporate Center Art Gallery in 1994 and 1996 and the Butler. Her work resides in major private and corporate collections including, the Cleveland Clinic, the Cleveland Indians, the Cleveland Plain Dealer, Progressive Insurance and TRW, Inc. In 2008, her Rowfant portfolio was acquisitioned by the Cleveland Museum of Art for their permanent photographic collection. In 1986 Jones published a photographic essay Cleveland: A Celebration in Color which sold out two editions. In 1989 she produced her second book, Walden in the Western Reserve. Two years later, her third book, Celebration II: Cleveland in Color was published. In addition her images have appeared in local, national and international publication such as World Architecture, Inland Architect, Forbes, Fortune Magazine, and Photo District News. In 1983 Jones was selected as one of Cleveland’s most influential women by the New Cleveland Magazine. 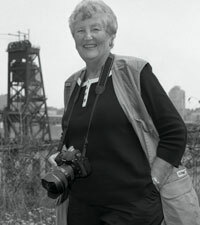 In 1992, the Cleveland Institute of Art gave her the Burchfield Award for her outstanding contributions to teaching, photography and leadership as a trustee. Jones is married and has a daughter and grandchild. She lives in Bratenahl, Ohio.